Long before the invention of the word ‘blog,’ there were people willing to write a journal or diary, a place where the writer shared similar thoughts, memories and emotions only with themselves and the page. My father, John D. Chetelat, Sr., was born in 1920, he lived through the depression, WWII, the Korean war, the sixties, Vietnam, Watergate, through to the turn of the century. Can you just imagine what that was like to experience? Oh, and he also spent six years in a monastery studying to be priest. He did not become a priest, thus I am here to write this blog. Near the end of my father’s life, he started to write down his memories. I’ve been told over and over how lucky I am to have his life story, and I think the one thing that I can do that will please my father the most is to share his story. I often post excerpts from his journal on Facebook. I’d like to share a few of these excerpts with you now. 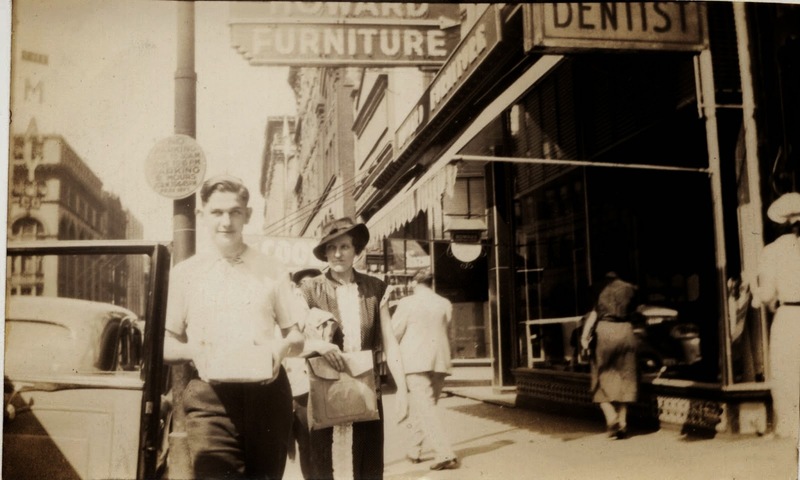 My father, John D. Chetelat, Sr., as a teenager shopping on Howard St. It was in November 1939 that I decided to take a temporary break from school to earn some Christmas money and to help pay tuition to the school as it was becoming financially burdensome on my mother and father. So, in mid-November I took a temporary job at Wards on Monroe St. The first three weeks weren’t too bad as I was working in the mail order tool department filling orders. But the last three weeks were a nightmare. In the actual mailing department there were these huge chutes that received orders from all over the mail order areas. During the day these orders were weighed and postage applied by women. State labor laws at that time said that women could not work more than 10 hours a day but there [were no limits] on how long men could be made to work. So when the women left, all the men in the mail order department took their places in weighing and stamping the packages. We worked until all the packages were taken care of – usually ten or eleven o’clock at night. Of course, we had to be back to work at eight the next morning. During the last two weeks before Christmas, I worked 14 days straight. All this for the magnificent sum of 30 cents an hour. This was the minimum in those days. My last pay check was for $32.60, which represented 40 hours regular time and 40 hours overtime. They wanted me to work Christmas Eve but I lied and told them I was going out of town that day. I was so tired I could have slept all day Christmas Eve, except that was the only time I had to do Christmas shopping. That was quite an experience. 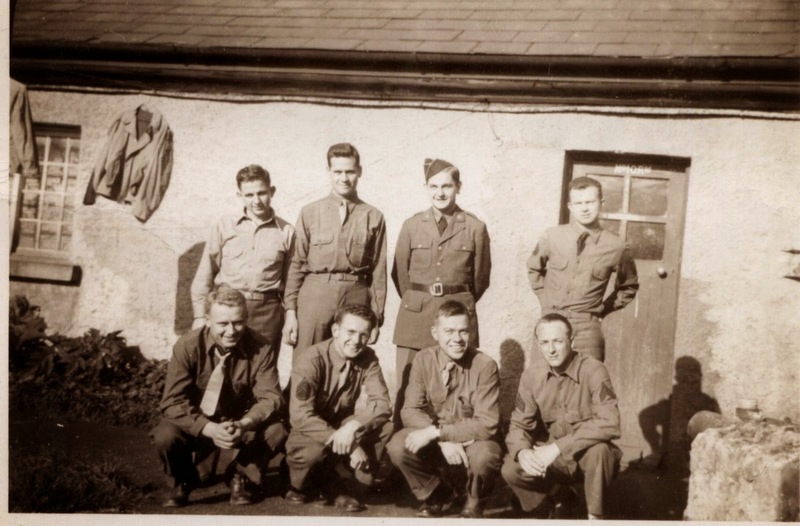 My Uncle Pat was another of my relatives about whom I have fond memories…. [He] lived with us from the time I was born until he went into the hospital in North Carolina. He had been drafted into the Army in the First World War. He was in his mid-twenties when he was drafted and had, by that time, become pretty independent. So much so that he was at odds with the military authorities on several occasions. The first time he got into trouble was when he was stationed at a camp in New Jersey waiting to be sent overseas. He went AWOL to come home to visit his sisters because he thought he might never see them again. Needless to say he was punished when he went back. He was smart and a good soldier when he wanted to be. He got several promotions while in France and was all the way up to a Sergeant First Class. Then he got into trouble again, (I never did know how or why) but anyway he got busted back to private. He was in the Army of Occupation in Germany until late 1919. He was sent home and discharged. He had gotten back up to corporal. Before he got drafted into the Army, he had become engaged to be married. 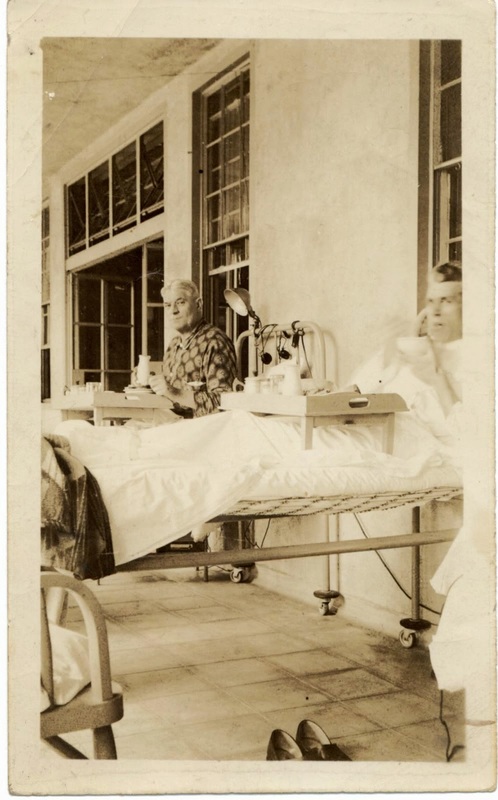 During the great influenza epidemic in 1918, his fiancée contracted it and died. After that he never had any interest in another women. He really took her death hard. When he came back to the United States, he came to live with my mother and father. He got a job working as a boilermaker for the Blaw-Knox Company. He worked there until he became too ill to work. He had been gassed once while in France and it started taking its toll when he came home. In May of 1944 we finally broke out of the German encirclement and started up Route 7 on the way to Rome. At the same time we broke out, the Allied Army broke out of Monte Cassino. (This was the same Army (Eighth British) that defeated the Germans at El Aliman and chased them across Lybia & Tunisia). It took another three weeks for us to reach Rome as the Germans were determined to slow us down as much as possible. I can remember riding up Route 7 on a hot day in early June with dead Germans on both sides of the road along with dead horses and other animals. The bodies had been laying there for several days and the stench from rotting flesh was unbearable. To this day whenever I smell rotten meat it brings back memories of the day. On June 5, 1944 we finally entered Rome. At the request of Pope Pius XII to declare it an “open” city, the Germans evacuated and left without doing much damage. Rome was the first of the enemy capitals to fall. We all thought that would be a tremendous news event, but it was hardly noticed because the next day, June 6, 1944, the invasion of Normandy began. This far overshadowed everything else. This entry was posted in baltimore, diary, history, journal, Uncategorized, world war i, world war ii by Library Staff. Bookmark the permalink.